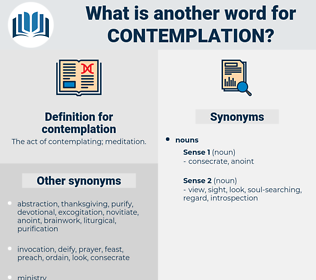 What is another word for contemplation? 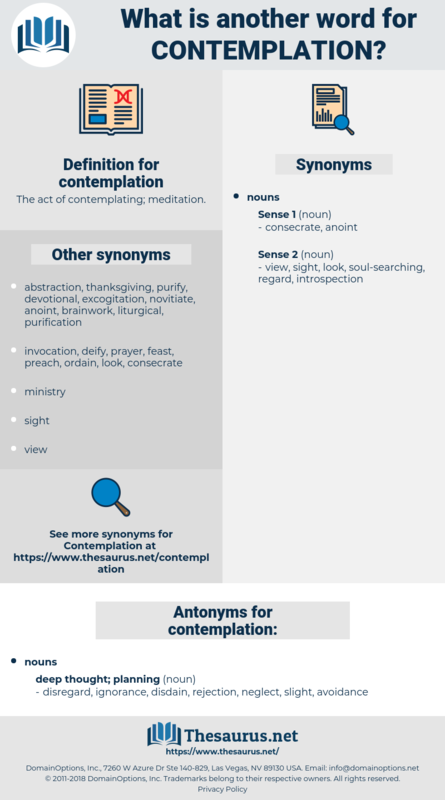 The act of contemplating; meditation. anticipation, deliberation, prediction, prevision, forecast, projection. disregard, ignorance, disdain, rejection, neglect, slight, avoidance. He looked about for a moment, and then sat down on the divan, folded his feet under him, and fell into a contemplation of the sphere. The words, the tone, both bore a touch of real pathos; nevertheless Lady Hayes smiled, as if, so far from being pained by the sad prospect, she found something amusing in the contemplation.